Individuals may join an e-mail list and receive an ecopy of the newsletter by Mailchimp automatically. Contact Glenda Watt. These newsletters are in PDF format. To view downloadable PDF files, you need Adobe Acrobat Reader. If you don't have it installed, visit Adobe's Web site to download for free. Adobe Reader allows you to enlarge the print to suit your eyesight. Run the cursor near the base of the document and use the + and - symbols to adjust. Click image to open PDF file. 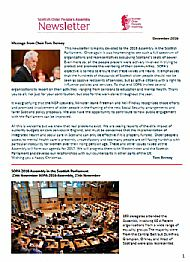 The final issue of 2016 mainly covers key messages from speeches, activities and questions raised at the Assembly in the Scottish Parliament. See also the 2016 Assembly page. Click on image to download a PDF file. 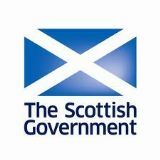 This is the 3rd newsletter of the year and the last before the Assembly on Friday 25th November which will be held in the Scottish Parliament. Read about the impact of the women's WASPI movement challenging the speed of pension equalisation. Learn what motivates the trustees and members on the Committee. 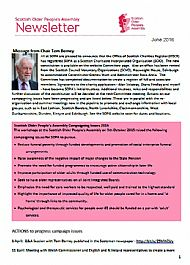 Click on the image to download a PDF of the June Newsletter. 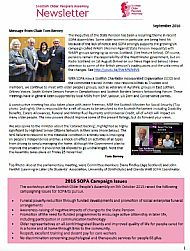 SOPA's second newsletter for 2016 provides an update on how the campaign issues identified in the workshops of the last Assembly are being taken forward. Also reports of events and future activities, and interesting new research. 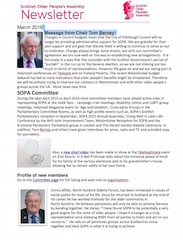 Click on the image to download PDF of Newsletter. On this occasion Mailchimp was not able to be sent to your Inbox and you will have received a PDF file. Please report any problems. You will need to have Adobe Acrobat Reader installed to view. an update of activities and involvement of SOPA and colleagues in national events.